London based multi-instrumentalist and producer Harlequiin (aka Rory Simmons) is no stranger to breaking a few barriers and questioning the restraints of musical genres as he breaks away from the herd with the release of his latest EP ‘Your Hearts Afloat’ out 16th April, submerging into promises of a fiercely strong solo artist. Rory Simmons is a multi-instrumentalist, producer and composer who has worked as a session musician alongside the likes of Blur, Jamie Cullum, Paolo Nutini, and in the last 18 months has appeared on tracks from Labrinth, Mount Kimbie and toured with the Maccabees, as well as touring worldwide as a session musician. He has released under other alter-egos, collaborated and contributed to countless tracks, albums and projects in the electronic world as well as across pop, jazz, classical and film/TV worlds. Over the last 18 months, he has produced 2 EP's for new breakthrough act 'Eloise' including her acclaimed last single 'Now He Wears White'. He has released 2 EP's as Harlequiin with radio play and recognition from BBC Introducing, Wonderland, Sidewalk Hustle, High Snobiety among others, with his previous single 'Something To Believe In' remaining in the Amazing Radio Top 40 for 4 weeks. 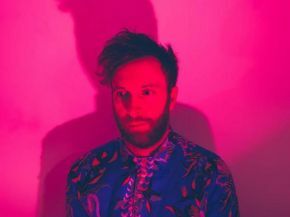 ‘Your Hearts Afloat’ is one to watch out for with a twisting, restless mix of electro, brooding RnB and alternative pop. It features guest vocalists Elliot Cole, Amelka May and Fini Bearman. Influenced by Kelis, MIA, Flume and Jamie Lidell, swooping guitar lines are underpinned by deep kick drums and pulsing sequencers. The mature electro-soul of Sampha and James Blake is given a fierce new energy here, quaking 808s brood under ribbons of analog-synthesizers, the wonky swing of 90's drum machines, and the gliding reverb drenched guitars on the edges of this deep song-writing. New single ‘Bandit In A Blindfold’ from the EP pleases instantly with a complex glitchy collection of sounds that explode in the ear at every turn of the track with and a soulful intriguing vocal leading the listener on through a piece that is incredibly fresh.